This website uses features that are not well-supported by your browser. Please consider upgrading to a browser and version that fully supports CSS Grid and the CSS Flexible Box Layout Module. Math Camp now open for Summer 2019! The Jack Byrne Scholars program is an elite honor for Dartmouth students who are interested in solving the complex problems of the world through math. All Dartmouth applicants will be considered for this special scholarship. Sonia Kovalevsky Day is a fun-filled day of mathematics with hands-on workshops and talks for middle and high school female students and their teachers, both women and men. 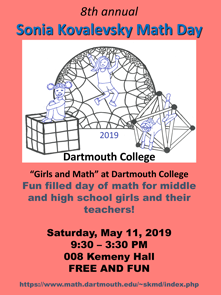 Originally started and funded by the Association for Women in Mathematics, the purpose of the day is to encourage young women to continue their study of mathematics and to assist the teachers of female mathematics students. 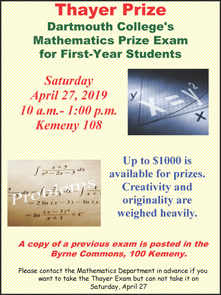 The Thayer Prize Exam, a Dartmouth mathematics competition for first-year students, will take place this year on Saturday, April 27 from 10am – 1pm. Please notify the Mathematics Department in advance if you would like to take the exam but cannot take it on April 27. Professor Yoonsang Lee and graduate student Victor Churchill recently gave research talks at New England Numerical Analysis Day 2019 at WPI. Professor Lee gave a talk about his recent paper A seamless homogenization method for multiscale diffusion and advection operators based on joint work with Bjorn Engquist at UT Austin. Churchill's talk was on joint work with Professor Gelb, Image reconstruction via edge-masked regularization .